It was towards the end of his career that Derek designed, constructed and launched the Crawford Fund and named it for his friend and mentor, Sir John Crawford. The Crawford Fund was dedicated to the pursuit of Sir John’s ideals in the development of national and international programs of training and research to assist agricultural productivity throughout the world. 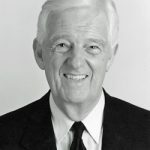 Derek was the Crawford Fund’s first Executive Director (1987-96), and in this role he wrote and lobbied passionately on the theme “Doing Well by Doing Good”. Derek had a life-long commitment to international agricultural research and, particularly in later years, to the Crawford Fund – the Australian national support organisation for IAR. It was with this considerable background of experience and understanding of the importance of IAR to the betterment of agriculture, fisheries and forestry in developing countries that Derek based his vision of a national organisation to promote and support Australia’s contribution to IAR through AusAID and ACIAR. So in 1986 Derek proposed to the Council of ATSE that such an organisation be established with the ultimate aim “to increase the amount and quality of research and development being conducted around the world, with particular emphasis of the needs of the less developed countries”. With Derek’s persuasive advocacy ATSE agreed and the Crawford Fund was established in 1987 with initial contributions from the Federal Government and private donors. 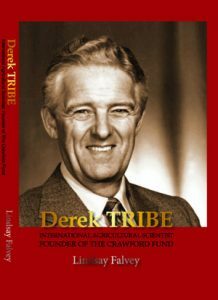 Once every two years the Crawford Fund awards the Derek Tribe Award.